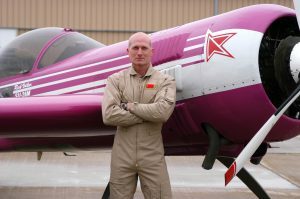 Accomplished display pilot Rick Volker was looking for avionics that would meet his exacting operational requirements, in both his certified and experimental aircraft. Rick chose Trig to equip his Sukhoi SU-26M aircraft – flown at airshows across North America and Canada. He demonstrates complete mastery of the aircraft’s flight envelope – pushing the boundaries of both low and high-speed flight in a tight display, that superbly shows off this remarkable aircraft. Rick’s SU-26M carries the Trig logo, highlighting the fact that he relies upon the quality and reliability of Trig’s certified radio and transponder. Rick has a TY91 VHF radio for communication and TT22 ADS-B Out capable transponder installed in the tiny SU-26M panel. 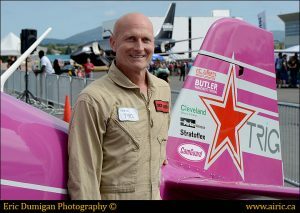 As an Experimental aircraft Ric uses the Trig TN72 GPS Position Source, in combination with his TT22 this meets FAR 91.227 and makes the aircraft 2020 ADS-B compliant, vital as he flies to and from shows across the U.S.
Rick’s pink Sukhoi SU-26M was originally designed by the Soviets, with just one job in mind – to become a world class aerobatic aircraft. This it achieved by using an ultra-high lift wing featuring a massive symmetrical camber. The aircraft’s titanium and composite airframe withstands G loads that are un-survivable by humans, even Ric. The nearly 400 horsepower, Vendeneyev M-14P radial engine has a better than 1:1 thrust to weight ratio. The result is a plane that can fly in unique attitudes, impossible in other types. Ric’s routine shows this power through both artistry and athleticism – alternating frequently between violent maneuvers and delicate finesse. Winner of numerous unlimited aerobatic contests Ric is also a keen athlete. His fitness is critical to coping with the punishing forces that aerobatic flight exerts on the human body. Flying the SU-26M Ric alternates between plus-11 and minus-9 Gs in the same manoeuvre! His experience as a warbird pilot is impressive, Rick displays a WWII Supermarine Spitfire Mk. IX, as a member of the exclusive Canadian Heritage Flight Team. He is one of a very few pilots in the world qualified to fly both the Messerschmitt Bf109E and G models. Other warbirds that he displays include the Hawker Hurricane MK XII and the Harvard Mk. IV.